High school student mentor (Big Cat), Emma, on one of her weekly visits to her Little Cat. 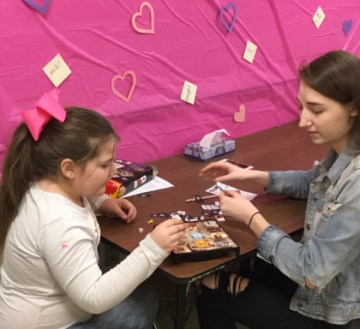 The Big Cat Little Cat Mentor Program pairs approximately 45 responsible, mature, helpful high school students with elementary and middle school students that are in need of additional friendship, guidance, and academic support. Our Big Cats routinely make hour long visits each week during the school day throughout the school year to their Little Cats. Student mentors (Big Cats) are selected through a rigorous process, participate in training(s), and work with students who are identified by school staff who would benefit from mentor-ship.